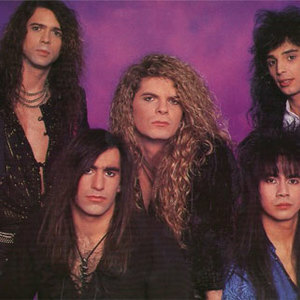 Heavens Edge was a highly melodic rock band that flirted with AOR. They played a similar style to that of Harem Scarem but came upon the metal scene too late to make many waves. Mark Evans (vocals), Reggie Wu (guitar/keyboards), Steven Parry (guitar), George "G.G." Guidotti (bass) and David Rath (drums) got together in Philadelphia, PA to form Heavens Edge. With an uncanny ability of fusing hard rock riffs with huge melodies, it wasn't long before their demo tape attracted Columbia records and resulted in a recording contract. Famed producer Neil Kernon was at the helm for the self-titled debut that managed to crack the Billboard Top 200. A video was released for the single "Skin To Skin", but when a second single was scrapped the group decided it would be best to part ways with Columbia. Landing a development deal with Capitol records Heavens Edge began working on a follow-up, but during this time Parry was replaced by Jimmy Marchiano (of LeCompt). About to showcase their new material, Marchiano defected to Blackeyed Susan that eventually led to the demise of Heavens Edge. A call from MTM records in 1998 led to the original band minus Parry to record a couple new songs to go along with the previously unreleased tunes on Some Other Place - Some Other Time. A new Heavens Edge album isn't out of the question, but the members are laying low for the time being.